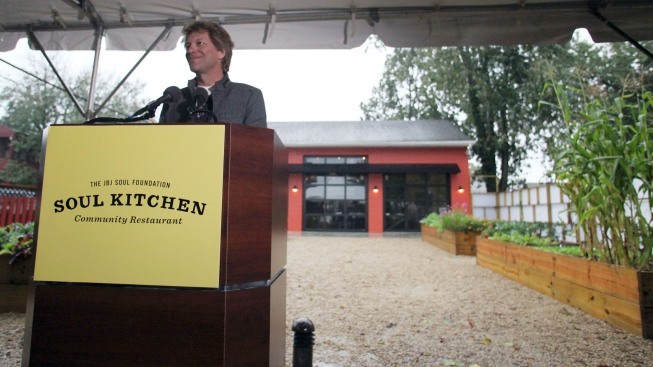 Musician and community activist Jon Bon Jovi at the grand opening celebration of The Soul Kitchen on October 19, 2011 in Red Bank, New Jersey. A New Jersey-based “community restaurant” owned by Jon Bon Jovi and his wife will serve a free meal to furloughed federal workers on Monday. JBJ Soul Kitchen, which is owned by Dorothea and Jon Bon Jovi, is teaming up with the Murphy Family Foundation — New Jersey Gov. Phil Murphy and his wife’s philanthropic organization — to offer the meal, according to a release. “We are thrilled to work together with Phil and Tammy Murphy on this endeavor, and this Monday we look forward to giving back in honor of Dr. Martin Luther King Jr.,” they added. The Red Bank-based restaurant, which Bon Jovi and his wife opened in 2011, normally lets patrons pay a suggested donation or volunteer at the restaurant to pay for meals, according to its website. Monday’s free meal will take place from noon until 2 p.m., the release said. About 800,000 federal employees have been furloughed or working without pay since the shutdown began on Dec. 22. It is the longest federal government shutdown in U.S. history.